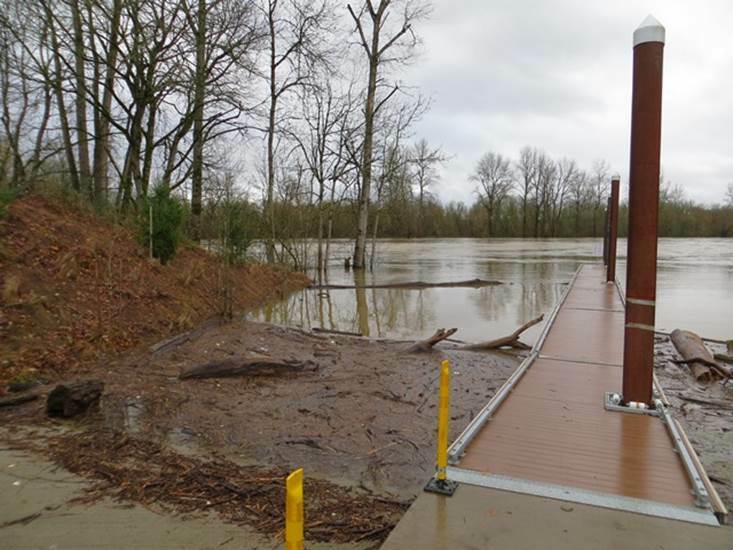 Keizer Rapids boat ramp with debris accumulating at the boat ramp. Finally a sunny weekend is forecast! This past winter’s snowfall and unprecedented wet spring has created some challenges for recreational boaters that will certainly test your skills . Swollen rivers bring debris flows with trees, root wads, and other material that can impact the safety of boaters on the water. Plan, research, and plan some more. Find out the river levels, plan for the weather conditions where you’ll be boating and know the timing of the tides. Make sure the boat ramp is open for launching. The Marine Board is working closely with facility managers and will include closure information on the Boat Oregon Map. Orange boat launch icons indicate a ramp is closed. Scout the river before running it. Rivers are dynamic, and don’t stay the same over time. Boulders and logs move, trees fall, and currents shift. When in doubt –scout and portage out. Better yet, if the river is calling you, go with an experienced, registered outfitter/guide. The Marine Board has an online Outfitter/Guide/Charter lookup function through the online storefront from the Marine Board’s website. Wear a life jacket. Given the water temperature and equally cold air temperature, boaters are encouraged to wear a properly fitting life jacket on the outside of their outdoor attire. Boat with others and stay within sight of one another. In motorboats, always have a first mate with assigned roles (i.e. one person stays with the boat and holds a bow line while the trailer driver parks after launching). Everyone will need to keep a sharp lookout. Anchor properly. Seems so simple, but this is a developed skill. It’s critical to have enough rode (line plus chain) and the right anchor for the waterbody you’re boating. You need to have at least 7-10 times the depth of the water in which to anchor. Many river depths change frequently, so a critical piece of equipment to invest in is a depth finder. Be sure to check out our past blog post on anchoring. Start out slow. Get your bearings, and expect the unexpected. Because water levels are high everywhere, there may be submerged objects just below the surface. Debris flows, with large logs in particular, can pack quite a punch, so boat smart and maneuver your motor trim accordingly. The last thing any boater wants is to blow a prop or get their hull punctured. Fill out a digital float plan and print out a copy to let others know where you are boating and when to expect your return. The digital form, when submitted, sends an email to the Marine Board that can be used later to aid marine law enforcement should a boater need help. It’s incredibly important to let other people know important information such as the make, model, and size of your boat, how many people are going out, and what activity they plan to do. 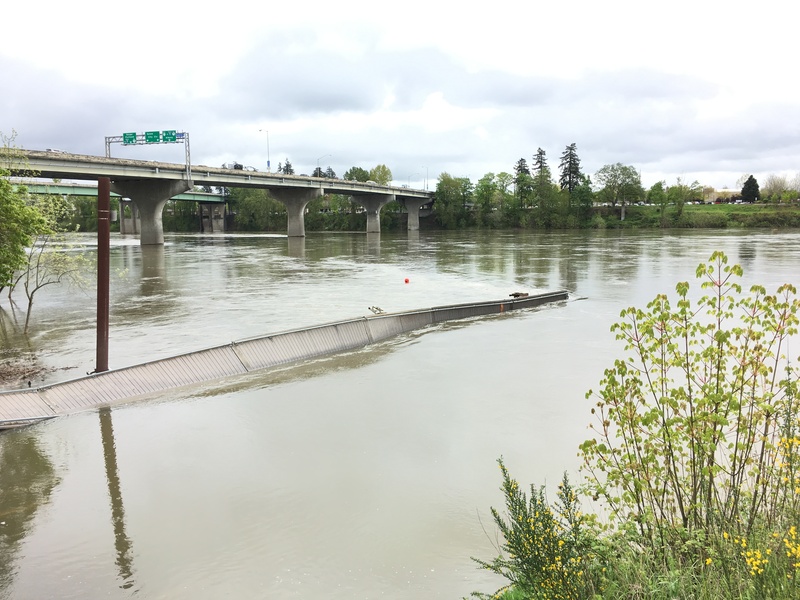 High water levels and large, woody debris may have contributed to the Wallace Marine Park’s boarding docks to shift and the pile hoops to break. The docks will be pulled and assessed. The boat ramp is currently closed. Visit www.boatoregon.com and click on the Boat Oregon Map to find a boat ramp near you. The website and the application are optimized for mobile devices.